Above: Edgar (c.943-975), king of England and husband of Aelfthryth. The infamous epithet 'she-wolf' as a term to denigrate and condemn controversial royal women who participated in domestic politics has most famously been associated with the fifteenth-century queen Margaret of Anjou, consort of Henry VI of England; although it has also been linked with Isabella of France, unpopular wife of the deposed Edward II and less commonly with the likes of Elizabeth Woodville and Anne Boleyn. However, it can more fairly be argued that court chroniclers and historians over the last thousand years viewed Aelfthryth, queen consort of King Edgar, as the original 'she-wolf'. Living over one thousand years ago in the Anglo-Saxon age, Aelfthryth's story was nothing if not tumultuous and dramatic. She was the first consort of England to be crowned and anointed as a queen consort, and later became the mother of a famous English king, Aethelred the Unready. She was the daughter of Ealdorman Ordgar, and she had royal blood by virtue of her mother's position within the Wessex royal family. Court chronicles created a dramatic legend surrounding Aelfthryth's rise to the queenship, for they claimed that King Edgar, besotted by Aelfthryth's incomparable beauty (in a story somewhat similar to the fabrications regarding the first meeting between Edward IV and Elizabeth Woodville five hundred years later), ordered the death of her first husband so that he could marry her himself. How Aelfthryth felt about the murder of her first husband and her rise to the position as queen remains unknown and mysterious, for chroniclers, in believing that, as a supposedly evil and immoral woman who sought to fulfil her own ambitions at any cost, did not seek out her true motives and feelings in these dramatic events. Rather they, and later historians, appeared to assume that her immoral qualities led her to rejoice in her husband's death and elevation to queenship. In 964-5, Aelfthryth became queen consort of England, aged perhaps nineteen or twenty. Whether or not she was Edgar's second or third wife is uncertain, although he is known to have fathered illegitimate children by at least two women before his marriage to Aelfthryth. Although Edgar according to later legends may have been entranced by his new queen's enchanting beauty and impulsively married her, it is probable that he was well aware that Aelfthryth's family had traditionally held great power in Wessex. Because the king's power base was centred in Mercia, the marriage alliance between the pair was a sound means of consolidating and extending Edgar's influence and power in England. The following year, Aelfthryth cemented her position as queen by providing her husband with a son, Edmund, who was to die young. Queen consorts were only fully secure once they had borne their husbands the much required male heir, in order to ensure that the royal family's lineage was assured and a peaceful succession probable. Royal wives who failed to provide sons were discarded or suffered ignoble fates, as the consorts of Henry VIII found to their cost. In 968, Aelfthryth bore her husband a second son, Aethelred. In 973, Edgar chose to crown himself as a means of asserting his unprecedented authority and power in England, with his queen also crowned and anointed. This splendid ceremony was a watershed in England's history, for never before had an English queen consort enjoyed a status so high or position as exalted. Aelfthryth was a suitable and effective queen consort whose sound political and religious duties have often been obscured or ignored in light of later scandals associated with her. She acted as an advocate in several legal cases, acting as a mediator between prosecutors and the crown, and because of her protection of female litigants she was effective in allowing greater possibilities for women in Anglo-Saxon England. She extended her protection to several abbeys, and was a benefactress at Peterborough and Ely. Her friendship with Bishop Aetholwold of Winchester allowed her to be closely involved in monastic reform; while taking charge of her children's upbringing. Aelfthryth was an unpopular queen consort among religious chroniclers, who demonised and denigrated her as an enemy of St Dunstan and, in order to blacken the name of her son Aethelred, associated her with the death of a bishop of Ely, with the seizure of Barking Abbey, the death of her first husband, and the murder of her stepson King Edward so that her own son could inherit the throne. Too much should not be read into these venomous and improbable accusations. Other early queens, such as Isabella of France, Margaret of Anjou, and Anne Boleyn were routinely slandered and cruelly attacked by contemporaries on account of their husbands' decisions, faults, and alliances. The gender of these women rendered them suspicious and accountable to prejudiced male observers; in the tenth century, Aelfthryth was linked with the heinous sins of witchcraft, murder and adultery by virtue of her gender and position as queen consort. As historian Pauline Stafford notes, 'most of the stories can be dismissed as later stereotyped accretions'. Aelfthryth's position and security as queen was threatened in 975 with the death of her husband, Edgar king of England. Although she felt that her son Aethelwold by virtue of his position as son of her husband had a natural right to become the next king, it was decreed that in fact her stepson Edward should inherit the throne. In 978, King Edward was murdered at Corfe Castle by Queen Aelfthryth's servants in order to ensure that Aethelwold acceded to the throne in place of his stepbrother. Because Edward later became a martyr and revered by religious figures, Aelfthryth was slandered as a she-wolf and a murderess. Interestingly, contemporary accounts did not directly blame her for her stepson's murder. It is more probable that it was the ambitious Aethelwold, eager to become king, who authorised his sibling's murder. Stafford again insightfully notes that 'candidates for succession were besmirched through their mothers'. Aelfthryth had died by 1001, aged in her mid-fifties, and she was buried in her foundation at Wherwell. It is highly unlikely that Aelfthryth was the murderous, cunning and evil woman later portrayed by venomous chroniclers and hostile religious figures at court, who sought to undermine her son's rule in favour of Edward the Martyr. Although she was probably ambitious for her son to become king of England, there is scant to no evidence that she was involved in her stepson's murder. Reading her experiences in light of contemporary gender and sexual prejudices illuminates the unfairness of continuing to view her as a she-wolf, for prejudice, distortion and hatred obscures our true vision of what she was really like. Her own actions during her tenure as Edgar's consort indicate that she was an effective and hardworking queen who operated smoothly in political and social relations. But the later rise of her son to the kingship and the murder of her stepson Edward blackened her earlier good works and destroyed her reputation irrevocably. Above: the famous Armada portrait (1588). "I know I have the body of a weak and feeble woman, but I have the heart and stomach of a king, and of a King of England too". - Queen Elizabeth I, Tutbury on the eve of the Armada, 1588. Yesterday was the 480th anniversary of the birth of Queen Elizabeth I, only daughter of Henry VIII by his second consort Anne Boleyn. The Elizabethan era was prosperous, exciting, and one never seen before or since. Many historians and commentators in the last four hundred years or so have suggested that Elizabeth was England's greatest monarch. I decided to write this blog post having come across an interesting debate amongst historians Alison Weir, Sarah Gristwood and Martyn Downer about who England's greatest monarch truly was, with the debate favouring either Elizabeth, her father Henry VIII or Victoria. Elizabeth was well aware that she needed to be a pragmatic yet sensible monarch in context of the fairly disastrous reigns of her predecessors and siblings Edward VI and Mary I. She revered her father's memory and demonstrably sought to emulate him in his magnificence and splendour, while desiring to be, like him, immensely popular with the English people. As a Venetian ambassador wrote in 1558, 'she prides herself on her father and glories in him'. Yet, for the first twenty or so years of her reign, until the growing threat of Spain escalated and Catholic plots surrounding Mary Queen of Scots intensified, Elizabeth was fairly liberal in her religious policies, unlike either her father or sister. While desiring that her subjects outwardly conform to the terms of the Elizabethan religious settlement, ostentatiously Protestant but considerably less rigorous than the Protestant policies of her brother Edward VI, Elizabeth famously quoted her desire not 'to make windows into men's souls' concerning religion. What could distinguish Elizabeth as England's greatest monarch is first and foremost the political and religious world in which she lived, and her decisions made in context of prevailing European behaviours and events. The late sixteenth century and early seventeenth century witnessed increasing religious violence and hostility in context of the European Reformation and Counter-Reformation. France engaged in acts of religious terror, famously comprising the St Bartholomew's Day Massacre of 1572 in which thousands of Protestant Huguenots were slaughtered, while Spain ruthlessly punished heretics and dissidents. The outbreak of the witchcraft persecutions escalated in this era, particularly intense in Germany, leading to the brutal deaths of thousands of innocent subjects, motivated largely by political tensions and religious conflicts. England itself had been influenced by the increasing religious bloodshed affecting all of Europe during this period, when Mary I chose to burn over 200 Protestant heretics at the stake in her five year reign. Monarchs were severely threatened in this era - several French kings died young, one of whom - Henry III - was assassinated; and the Scottish queen Mary was deposed by her subjects on account of her unacceptable Catholic religion and political decisions. Above: St Bartholomew's Day Massacre, 1572. Yet Elizabeth did not impose religious bloodshed on her people. As has been already suggested, she allowed people to hold their own religious beliefs and follow their own practices in the privacy of their households, as long as they outwardly conformed to the Protestant settlement enacted by the state. Unlike the Spanish king or in France, she did not punish heresy ruthlessly, and did not enact a reign of terror in her country, unlike her elder sister. She was pragmatic, relatively liberal, and desiring of peace. It was only considerably later, in the 1580s and thereafter, that she began to more ruthlessly punish Catholicism, not because it was associated with heresy but because of its political threat - it was classed as treason. This was only done in context of plots surrounding Mary Queen of Scots, and assassination attempts by hostile Catholics. This seems to mark out Elizabeth as a contender for England's greatest monarch, in view of her religious tolerance and in view of the fact that, unlike either Henry VIII or Victoria, she faced a far greater threat from Europe. Returning to the foreign policy dimensions of Elizabeth's reign, she could be viewed as England's greatest monarch on account of the fact that, as a woman (when many such as John Knox argued venomously that women had no right whatsoever to rule over men) she was already constrained by her gender, and yet was able to preserve peace and stability in her realm when faced with the hostility of both France and Spain. Most famously, she managed to defeat the Spanish Armada in 1588, and her countless marriage negotiations with men of both these powers - most significantly, the Duke of Anjou in the 1570s and the Archduke Charles of Austria - meant that she was able to remain on good relations with these countries by virtue of the fact that she offered the promise of matrimony with either one of them. As long as she did so, they did not dare to attack her. 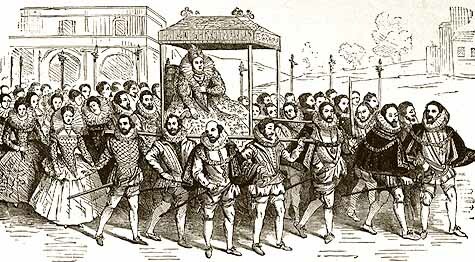 Above: Elizabeth's funeral cortege, 1603. Elizabeth's reign is extremely famous for the adventures of exploration and trade which began in earnest during the late sixteenth century. She sponsored and supported heroic individuals such as Sir Francis Drake, and a colony in North America was founded which was named after her - Virginia. England's empire expanded globally, and began to engage in competition with the more formidable Spanish empire. Strong relations were maintained with Russia, and there was even the possibility of an alliance between the two nations. Trade and strong diplomatic relations developed between England and the Ottoman Empire. Significantly, Elizabeth was able to achieve a long lasting alliance with Scotland following the execution of Mary Queen of Scots through friendship with James VI and the two kingdoms would finally be united on James VI's succession to the English throne; something which other English monarchs, such as Henry VIII, had spectacularly failed to do. On top of this, Elizabeth successfully ensured that England became a main player in Europe, supporting fellow Protestants in the Netherlands and France, and her own religious tolerance and shrewd political pragmatism enacted the beginnings of Britain as a Protestant kingdom and, later, a secular state - although this would surely have alarmed the Protestant Elizabeth. The Pope described Elizabeth in admiration and awe, despite being hostile to her: 'She is only a woman, only mistress of half an island, and yet she makes herself feared by Spain, by France, by the Empire, by all'. Elizabeth celebrated many other achievements too. Her patronage and development of the navy carried on the work began by her father and encouraged by her sister, and this ensured that England's navy continued to become more prosperous and successful, which was important in view of the challenges England faced later in the reign from the likes of Spain as a sea power. She was also able to survive severe hostility in her own realm in the wake of Catholic plots and the outbreak of the Northern Rebellion in 1569, preserving her hold on the throne while maintaining peaceful relations with her subjects. As is well known, learning flourished in the Elizabethan era, with science, philosophy and literature expanding greatly, producing momentous individuals such as William Shakespeare and Christopher Marlowe who continue to be celebrated and revered today. 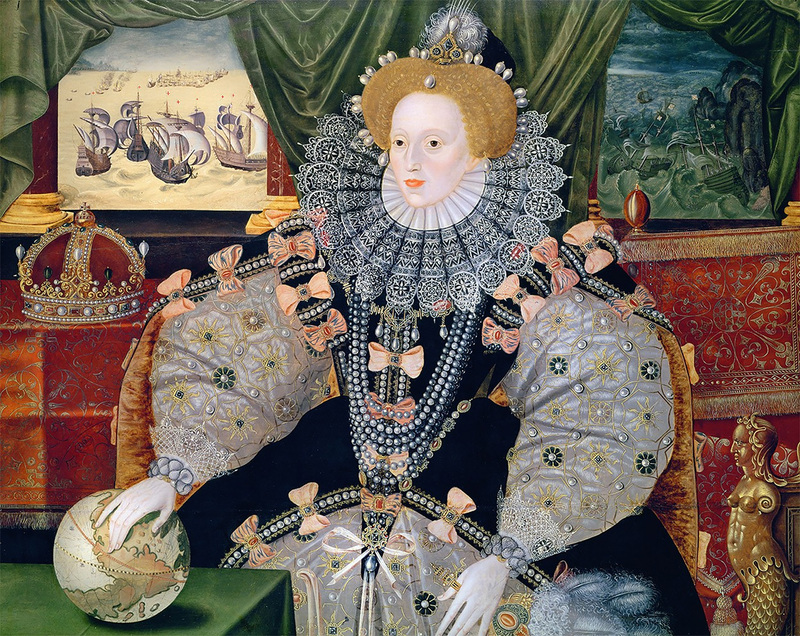 Unlike her brother or sister, Elizabeth was able to rely effectively on shrewd and intelligent political advisers such as William Cecil and his son Robert to ensure that she made sound political and religious decisions, and ultimately to preserve England's stability as a state both nationally and globally. As a person, she was a shrewd survivor, overcoming the hostility of her sister Mary and continuing plots from dissatisfied Catholics both at home and abroad. Many historians have earnestly celebrated Elizabeth's achievements and laud her as England's finest ruler. In the early 20th century, she became a symbol of England's national resistance to foreign threat, particularly because of the spectacular defeat of the Spanish Armada. Elizabeth's biographers including John Neale and A.L. Rowse celebrated her reign as a 'Golden Age' of progress. Sarah Gristwood goes so far to say that 'without Elizabeth we would not be who we are today - children of a proud (and Protestant) nation. The Virgin Queen... is a vital part of our national mythology... Before Elizabeth, no woman had ever successfully reigned over the country. After her, no-one could ever again relegate women to the sidelines so easily', setting an important precedent for the later female monarchs Victoria and Elizabeth II. Other historians, however, have been more reserved and some have even attacked the notion that Elizabeth was England's greatest monarch. Professor David Loades believes that Elizabeth 'failed to find a satisfactory definition of the constitutional relationship between crown, lords and commons', while failing to solve the problem of inadequate revenue. He believes that she was unwilling or unable to accept change, meaning that 'she was so concerned to remain in charge of the ship, and to avoid the icebergs of Spanish and papal hostility, that she failed to spot the other unobtrusive rocks lying in her path. She was not on the bridge when the ship went down'. Christopher Haigh points to military and naval failures, while offering only very limited aid to fellow Protestants in Europe and failing to provide her commanders with sufficient funds to make a difference abroad. '[at a time] when wars and seditions with grievous persecutions have vexed almost all kings and countries round about me, my reign hath been peaceable, and my realm a receptacle to thy afflicted Church. The love of my people hath appeared firm, and the devices of my enemies frustrate'.